Every single individual on the planet will process adversity in their own unique way. We may see the pathways other’s take to navigate challenges for what they are; the accumulated knowledge, emotional tools, and spiritual practice, physical capability and mental acuity, being encouraged to finely tune once more to a higher vibration of being. We may cheer on others as they navigate their current lifetimes struggles, we may offering encouraging words of Hope or Love. Ultimately however whether it be a beloved, a child or a stranger in need, it is through asking and listening clearly to what they truly identify as helpful, and communicating an equally candid response based on our own personal well being, for if we are willing to give, what they seek to receive. 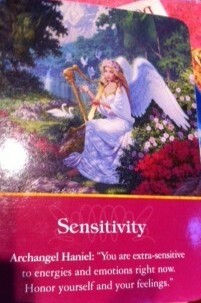 This card shows the wings of light that one being, rising up into a there truth of self awareness or creative problem solving, can offer all those whom follow. Perhaps, we are all waiting for the divine spark of someone to clearly show us there is in fact ‘another way’ beyond what we have witnessed or previously experienced. Perhaps in bearing witness to the diversity of the bountiful earth, we gently become a better society as a whole. The focus this week is on Hope, in all the many aspects of being. What do we allow, or not allow ourselves to hope for our individual and collective future? Do we allow hopefulness for Peace, Love, Prosperity or Abundance? Sometimes, during deep self analysis, we uncover another karmic layer of debris, that has been blocking a flow of cosmic consciousness, and in so doing we are able to clearly choose with honesty and compassion, that yes, we are ready to Hope for ‘more or new or Joy’ even if we do not yet have the words, or action or plan, for what we are attracting at this time. 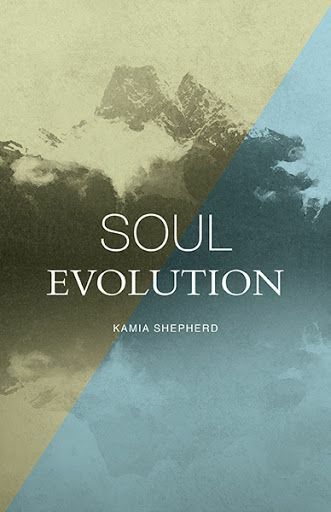 *Author of ‘Soul Evolution’ a gentle resource for identifying, strengthening and honouring ones personal gifts through Soul Path exploration, Akashic Records, and energy healing. *Available worldwide through Amazon, iTunes, Chapters/!ndigo, Barnes and Noble, Nook, Kindle, Google Play, and select bookstores. It is a time on the planet with incredible potential for transformation and change both on an individual level as well as humanity in its entirety. Be conscious of the effects of the transformation on your mood and energy level, take time through out each day to re-focus awareness on your inner being and wellness. Be patient and gentle as lifetimes of karmic debris sift past or around or off of you and others. Call on your helpers and guides to bring more light into your being and to cleanse your aura. Give yourself the gift of inner balance, allowing emotions to flow through you, but not control you. Breathe in fresh pure air, and feel sunlight on your face. Make a commitment to radiate your inner light outwards, and others will be inspired to also shine. Each human and being on the planet has light to shine. When we are all shining, there are no limits to what can be healed and manifested. What is a message for people regarding inviting blessings into their lives? Magical Mermaids and Dolphins deck. 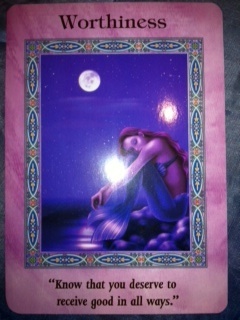 Many people are becoming more adept at manifesting and feeling familiar with positive affirmations. One of the key ingredients to manifesting, however, is to heal any emotional wounds or beliefs that block the positive flow of divine blessings, by working on ‘knowing’ one is ‘Worthy’ of blessings. This means continuing to tell the self, and the loud and sometimes abusive ego, that we are all Worthy of love, good fortune, health, vitality, happiness, and prosperity, every day. If we carry a belief structure that is based on fear, such as ‘I am only worthy when I have done something that deserves reward’, this could be a thought such as income or weight or fitness level,then we are sending out a negative affirmation to the universe. The angels and guides, and your higher self, as well as whichever Deity resonates with you, already believe you are deserving of blessings. 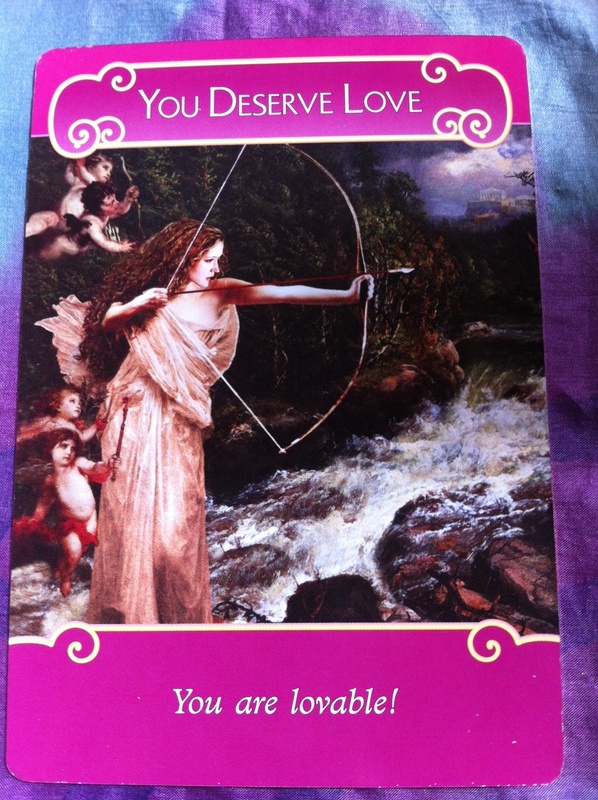 They are with you, at your periphery, whispering that you are lovable, beautiful, talented, and worthy right now! When we allow ourselves to believe we are worthy of blessings, they will appear far more quickly. Some of the ways we can overcome heart chakra blocks, and heal emotional patterns are through loving self affirmations. Gentle touch such as massage with a practitioner who one feels safe with, and is energetically intuitive can be very healing for the heart. Another way is to use the essential oil of Rose. The oil can be placed directly over the heart center as well as behind each ear. As it is placed on the body, try the prayer “I receive divine love, I am worthy and deserving of Love. I hear messages from the world and myself that are loving.” You can also buy an actual rose or download a picture of one to watch the beautiful unfurling of its petals, and visuals the same unfurling at your own heart center. The message I hear angels and guides shout, more than any other to all people is : “You are worthy and deserving of Love!” Allowing in blessings and manifesting, is rooted in Love. Your post for July 29-Aug 4th, really resonates with me. I’ve been practicing going back into times in this life that I was hard on myself, or afraid. I practice hugging that little girl or young woman, and giving her loving words of encouragement. It is so empowering to make those changes of being gentle on the self. It really does soften this whole experience in this life. I love the idea to also forgive the world for not growing fast enough in the ways we dream of for peace. This gives me a sense of support as I feel renewed faith in our world that change will happen, perhaps just not as quickly as I hope for! !